Tain, Scotland’s oldest Royal Burgh, is five miles away and the beach at Royal Burgh of Dornoch lies just fifteen miles to the north. Golfers are spoilt for choice in having Royal Dornoch Golf Club near by, their Championship course is ranked 5th in the world and the Struie course is ranked in the UK and Ireland’s top 50 links courses. Tain Golf Course, a traditional Scottish Highland links course designed in 1890 by Old Tom Morris enjoys stunning views and sheltered climate. In addition there are further courses at Alness, Golspie and Bonar Bridge to name just a few. We are ideally located for those travelling to and from the Orkney Islands. The ferry terminals of Gills Bay (Pentland Ferries) and Scrabster (North Link Ferries) are no more that 2.5 hours drive with John O’Groats just 2 hours away. 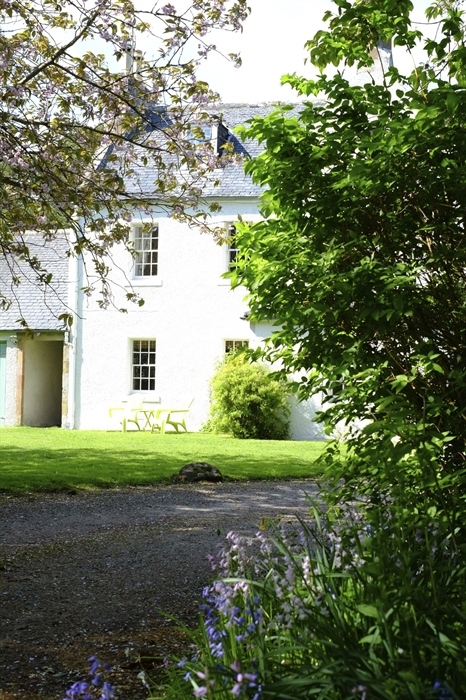 The Old Manse has three well appointed bedrooms, two king sized doubles and one twin room. All rooms are spacious with ensuite facilities and have recently been refurbished. Please note only two rooms are available to let at any one time. The period features of the rooms have been retained which include high ceilings, decorative cornices, shutters and fireplaces. Each with views over the tree lined drive and gardens. Complimentary toiletries, luxurious cotton bed linen and fluffy towels await you. We provide a hot drinks tray that includes hot chocolate and fresh milk. For those who want access to the outside world WIFI is available throughout the house. Flat screen televisions and hairdryers are provided in each bedroom with an iron and ironing board available on request. To add to your comfort we have a guest sitting room overlooking the garden, which is stocked with an interesting range of books and board games. On cooler evenings the wood burner is lit adding to the relaxing surroundings. A good day deserves a great breakfast………. Whether stocking up with a full cooked breakfast before a day out or simply enjoying toast and marmalade with freshly brewed coffee. Breakfast is served from 7.30am through to 8.45am Monday to Friday and 8.00am until 9.30am at the weekend. For those who need to be up and out earlier we are always happy to organize a time that suits. Available is a selection of fruit juices, cereals, muesli, yogurt and fresh fruit from the buffet. The Old Manse is a totally non-smoking establishment. Regrettably we do not accept pets in the main house. Please click here for our TripAdvisor page.